Equity Research is the process of analysing the company’s financial performance, ratio analysis, forecasting the financial statement in excel and conducting valuation for arriving at the intrinsic value of the share. Based on this valuation, the expert researchers recommend whether to “Buy”, “Sell” or “Hold” a stock. What do we understand when we mention the word “Research”? Research is the act of finding out every detail pertaining to the subject of research and deriving meaningful insights related to the subject. In Equity Research, the subject of research is the share of a company. Equity Research can be done for two kinds of clients. If the Equity Research is done for investment banking it is called the “Sell side”, while if the research is conducted for a financial institution or an independent organisation, it is known as “Buy Side”. You may have heard that some analysts talk about equity research in terms of industry, company, and the performance with regards to the economy. Whereas, there are analysts who tell about shares with terms like Bollinger bands, charts (bar and line), graphs, candlesticks etc. The former is known as Fundamental Analysis, while the latter is known as Technical Analysis. The Fundamental Analysis is a holistic approach and studies the shares of a company in relation of the past historical performance of the company, industry and economy as a whole. On the other hand, the Technical Analysis pertains to studying the future movement of the prices, with respect to the historical price and volume. 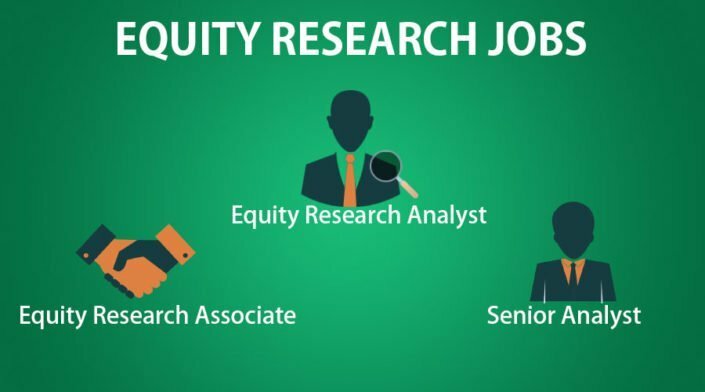 Before understanding the scope of Equity Research as a career, let us understand the possible areas where an Equity Researcher is employed. An Equity Researcher is employed in either independent research houses, Knowledge Process outsourcing (KPO) or Stock Brokerage firms. Usually, there is a Research Head under whom there is a team of Analysts. There are many junior level associates who report to the Analyst. Hence, being an Associate is an entry level position, wherein you graduate to the Analyst level on the basis of skills gained and their educational qualifications. The division of work is usually according to the sectors. Each team of the analysts and associates handle a particular sector such as Automobile, Cement, Information technology, Infrastructure, Oil & Gas or the Consumer Discretionary sector. There are multiple teams in each sector and each analyst handles a group of -5-6 companies. The Associates who work on the primary research are allocated companies based on their years of experience and skill sets. The companies can be from the Indian sector or the international sector depending on the clientele of the Independent Research agency. What is the work profile of an Equity Researcher? The primary responsibility of an Equity Researcher is to produce reports and give stock recommendations. These reports can be of various kinds. It can be a sector update report, coverage initiating report, a quarterly/ annual result update, or a simple flash report. One of the other responsibility of an Equity Researcher is Financial Modelling or predicting the performance of the company based on the historical performance. Working as an Equity Researcher is akin to being a research student. You need to be always surrounded by latest reports, research materials available either online or offline, books as well as assignments, thesis and papers. Another crucial aspect of being an Equity Researcher is to maintain a lot of accuracy and meet strict deadlines. There is a lot at stake and there are shareholders and investors who wait for the Equity Research Report to base their next decision. What does it take to be an Equity Researcher? To be an Equity Researcher, you need a plethora of skills. Some of these are inborn while some can be cultivated over a period of time. The innate skills are analytical mindset, ability to dig deeper information, good research capabilities, and an eye to join the dots and identify trends. Apart from this, there are several skills that can be learnt and picked up along the way. These include Financial Modelling, Data Analytics, Excel skills and Report writing skills. There are also specialised courses which train you to be a top notch Equity Research Analyst in an Investment Bank. There is CFA which is the most renowned global course in the field of finance. Each module of the CFA program is specially designed to help you understand the finer nuances and make you an expert in Equity research and analysis. Another program is the PG IB & CM which is a comprehensive program designed especially for the students who want to build a career in Equity Research, Investment Banking and Capital Markets. One of the main features of the PG IB&CM course is that it involves role play to teach you the skills required for being a researcher in the real world scenario.